South Africa is today one of the major producers and exporters of wines worldwide. The Cape Winelands are just beautiful. Think green rolling hills packed with endless rows of vines, all drenched in bright sunshine. These are wonderful spots for a rural retreat full of long lazy lunches and rosy-cheeked afternoons of wine-tasting. After some heavy duty sightseeing (not to mention shopping) in cosmopolitan Cape Town, the Winelands will be a scenic breath of fresh, crisp air. If you're a wine lover or a grape nut, you'll be in complete heaven amongst these lush valleys and highlands. South Africa is the oldest wine producing region beyond Europe and the Mediterranean. 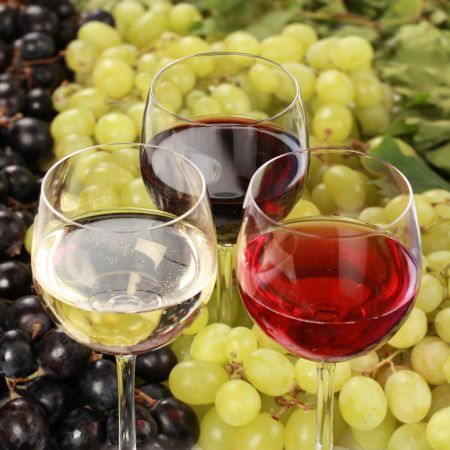 Grapes have been ripening here happily since the middle of the 17th century and today, South Africa is a major player in the world of wine, exporting gallons upon gallons each year. The first vineyard in South Africa was planted by Jan van Riebeeck in 1655, and the very first wine was pressed in 1659. Equally, when the Protestant French Huguenots fled persecution in the 17th century, they found an idyllic rural refuge in the valley of Franschhoek with its rich, fertile soil and temperate climate. The Huguenots quickly realised that this small slice of South Africa was perfect wine-growing territory and set about planting vineyards which are still thriving today. A whole new heady, intoxicating industry was born. The climate in the Cape Winelands is delightfully mild and near-Mediterranean, with cool rainy winters and long, warm summer days. This makes it a wine-grower's dream. A huge variety of vines flourishes here and the wine estates are all set against a spectacular backdrop of mountains, slopes and valleys. It really is as pretty as a picture - the perfect place to get lost in a pastoral daydream for a few wine-soaked days. The major wine-producing pockets of the Cape Winelands include Stellenbosch, Franschhoek, Paarl, Wellington and Constantia. These areas are liberally scattered with rows of vines that stretch as far as the eye can see. Dotted between these vines, you'll find boutique wine-estates offering wine-tastings and guided cellar tours. There are established wine routes to explore in each of these places, weaving in and out of several wine estates for tastings and tours along the way. You'll also find a handful of restaurants on each route, where you can stop for a spot of lunch with a panoramic view and a glass of local Pinotage. This a wonderful way to while away a few sunny hours. Most of the estates are open daily for people passing (or staggering) by, but it's still best to check first, as a few of the smaller producers book tours by appointment only. We certainly wouldn't want you to be left disappointed - and thirsty! Slightly further afield, yet still only 2 hours from Cape Town, you'll find Swellendam and the sweeping wineries of the Robertson Valley. Although this lovely valley, backed by the Langeberg Mountains, is not ‘strictly' part of the Cape Winelands, it is currently being hailed the rising star on South Africa's wine scene. This makes it a great place to sneak a look, and a generous sip, of the future of South African wine. Whichever wine-growing region you choose to drop in on during your South Africa holiday, you'll be in for a sublime, sunny and slightly tipsy treat. If you spend a couple of nights in one of these valleys, you can try your old favourites, go on a vine-voyage of discovery to seek out new sips and soak up your beautiful surroundings. It's a superb area to slow your pace and spend some time indulging in the simple things - good conversation over a great meal and a great glass of wine (or two). Wine aside, there's plenty more to see and do in the Cape Winelands. The hills and valleys are perfect picnic territory - brilliant for hiking, cycling and horse riding,. 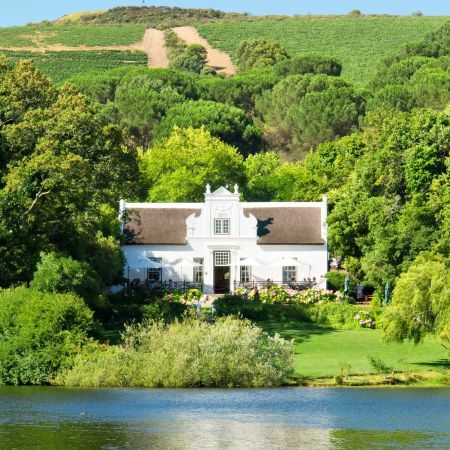 The wine-growing towns and villages come with their own fascinating histories attached, from the French heritage of Franschhoek to the stately tree-lined avenues of Stellenbosch, complete with class Cape Dutch, Georgian and Victorian architecture. As the Cape Winelands are just a stone's throw from Cape Town, they are a wonderful place to break up a busy itinerary with a few days of relaxation in a rural idyll. Alternatively, if your trip is ending in Cape Town, it's a simply lovely way to spend your last couple of days in South Africa. You'll only be an hour from Cape Town International Airport, so you can sit back in the sunshine with a crisp glass of South Africa's white and look back over the trip of a lifetime. Perfect. After a hard day of sight seeing, wine tasting, exploring, lying by the pool or just shopping in the village, what better way to end the day than to retire to the comfort of your luxurious room. The Luxury Suites flank the farm's inner manicured green lawn area. Klein Oliphants Hoek is an elegant, sophisticated and comfortable boutique hotel with 8 elegantly decorated en-suite rooms, set in the heart of the Franschhoek village. Built as a mission station in 1888, a stay here will offer old-time chic and a touch of colonial splendour, combined with warm, personalised service. Majeka House is an ideal base from which to explore the historical town of Stellenbosch with its interesting shops, galleries, museums, and alfresco cafe culture. This prime location combined with luxurious accommodation, thoughtful service, a bar, restaurant, spa and spacious grounds creates what is undoubtedly one of the most stylish boltholes in the Cape Winelands. The impeccably appointed Le Franschhoek Hotel offers unequalled views of the spectacular Franschhoek Mountains located in the equally splendid world famous vineyards of the Western Cape. Le Franschhoek follows the architectural style of the Cape Winelands. The 18 Terrace Suites are in groups of 3, scattered around the estate. All are built in the original Cape colonial style, with thatched roofs, shutters and trailing vines over the private outdoor terrace. The spacious Garaden Suite Deluxe rooms offer a private terrace and can be linked to a Garden View Room to offer family accommodation. The Mountain View rooms are attached to the main house.